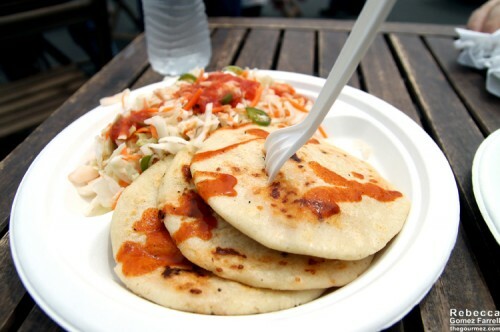 Izalco Catering is a Salvadoran catering business that serves up pupusas at the San Ramon Farmers’ Market every week. That just happens to be near my husband’s workplace, so I joined him for lunch one Thursday afternoon, and we ordered five of their pupusas to share. As you can see, they are each about the size of a salad plate, so two are plenty filling! In the picture are three Southwestern ones made with cheese, chipotle chicken, and onions. 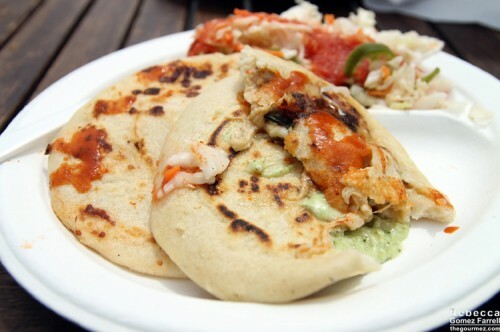 You can watch the workers make the pupusas from scratch after you order, forming the pockets by patting the masa dough together and stuffing them with fillings. It’s a good way to entertain yourself as you wait for yours to come up! The pupusa pockets were perhaps slightly undercooked, having a stretchy, limp quality but maybe I’m just unfamiliar with the Salvadoran style. I found them satisfying regardless, because of how fresh and warm they were. The pockets themselves are on the bland side, so Izalco packs a lot of flavor into their fillings, especially the ooey, gooey cheese and sauce pouring out of the Southwesterns. It was only slighty spicy—do not fear, those of you with sensitive palates. 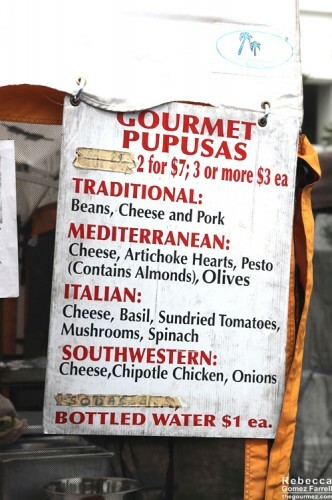 That’s a Mediterranean pupusa cut open. It’s made with cheese, artichoke hearts, almond pesto, and olives. Still tasty, but the flavors were kind of odd in a pupusa, mostly because they were too bland to liven up the dough. But I always like experimentation, so I can’t knock Izalco for that. The pupusa underneath it was an Italian with cheese, basil, sundried tomatoes, mushrooms, and spinach. Those flavors melded better, with plenty of strong elements to stand out in the filling. But I thought the Southwestern was by far the best that we tried.